Minister of Irrigation Mohamed Abdel-Motteleb told Al-Ahram daily newspaper that Egypt may in a few days send an official statement demanding that construction of the Ethiopian dam be halted until a mutually agreeable solution is found. Irrigation Ministry spokesperson Khaled Wassef told Ahram Online that four attempts to negotiate the matter, the last of which proved an utter failure, have already been extended by Egypt. Abdel-Motteleb also told Al-Ahram daily that should the Ethiopian government offer new solutions, Egypt would nevertheless welcome a new round of negotiations. "All proposals submitted by Egypt to the Ethiopian government have been obstinately rejected and without explanation," Wassef added. The planned Grand Renaissance Dam is a $4.2 billion hydro-electric dam on the Blue Nile, one of the main tributaries of the Nile. The project has been a source of concern for the Egyptian government since May last year, when images of the dam's construction stirred public anxiety about possible effects on Egypt's share of the Nile water, the country's main source of potable water. Egypt, Ethiopia and Sudan formed a tripartite technical committee to study the possible effects of the dam and try to generate consensus. Ethiopia maintains that Egypt's water share will not be negatively affected by the successful completion of the project. In recent meetings in Khartoum, the tripartite committee was scheduled to formulate a document that entails "confidence building measures" between the countries, and also to form a special international conflict-resolution committee. 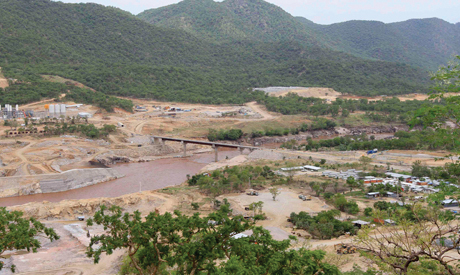 Wassef has earlier said that the Ethiopian Grand Renaissance Dam faces financial as well as technical problems, and that the Ethiopian government's statements that the project has been 30 percent completed are a "media show" for its own political gains. Egypt has demanded that Ethiopia submit construction plans for the dam for assessment by international experts. Meanwhile, Ethiopian Irrigation Minister Alamayo Tegno said his country is committed to the recommendations of an international committee of experts. Some Eritreans Gov propaganda guys are insulting Ethiopians and Egyptians and trying to make a havoc here and elsewhere. BE AWARE AND JUST IGNORE THEM focusing on main subject. Ethiopians, Egyptians, and Sudanese are bound to share the Nile. The only point is how to share it fairly. I think Egypt has to stop being too selfish and avoid creating enmity the effect of which will last too long. Egypt's experts are part of the panel which wrote hundreds of pages report and assured that the dam is not a danger. So why a new bravado now then and reference British Vs Egypt treaties Ethiopia does not even know. Egypt is sitting on massive underground water and not sure why it has to politicize Nile too much ... Also, Ethiopia and the joint Panel of Experts already assured that the dam will not substantially reduce the water as it will take water especially during the rainy seasons ... Better for Egypt if Ethiopia gets renewable energy than cut its trees and all rain shortage expands the Sahara. Generation is continuing there in egypt and here in ethiopa and nile is continuing resource as well. so as to me all stake holders should strive only for lasting solution for coming generation. after all forceful solution can never serve this view and it is costy option for all if not only for egypt. no one should die or deeply starved while doors are still open for fair share of common resource. we all reparian nations even neeed to work hard for an other technological solution to satisfy our ever icreasing demand of power supply. because the number of our population is increasing while the volume of nile waters is stagnant and even decreasing due to global warming. may God bless Ethiopians, Egyptians and the rest. The only way for Egypt and Ethiopia to come to a solution is talk the same language on the same table. If Egypt accepts Ethiopia's quota, then it will not be difficult for Ethiopia to assure its quota according to Entebbe agreement. Who is Egypt to ask? First of all, they have the answer. Secondly, Ethiopia will do whatever it likes with its quota. Egypt just want to act like a "Veto power". After all, it is self proclaimed "Veto Power". Egypt : an offensive realist state? I understand the frustration of the state of Egypt over the increasing momentum in the bargaining Power of Ethiopia and where this might lead to. However, Egypt should also wake-up and realize the plain truth that Ethiopia - unlike Egypt - is a defensive realist state and its rise will bring about a multilateral benefit of swimming in the Nile together. If not, the other option is still palatable to Ethiopia and Sudan as they have already agreed to swim rather than drown in the Nile. Egypt should also refrain from using those old fashioned and empty threats that will lead nowhere rather than embarassing itself. Why Egypt is so foolish? Wake up Egyptians; negotiation not bullying will serve you good. For centuries, intimidation, bullying and meddling in the internal affairs of Ethiopia had worked in your favor. The Ethiopia your ancestors had dealt with is no more. "Accept our unjust proposition even it makes no sense" can only get you loose what you have. Hope there are people of common sense, who can sacrifice their pride and negotiate on a win-win basis. As for the showing of muscles displaying armaments and release of new arms deal, this won't flinch us from using our rightful resources. The so called " mechanical/hydronic engineers" use your wisdom for your national use. You should learn from your neighbor on efficient use of water. egyptians almost admit all their mistakes and arrogance, the almost realized that they can't solve their crisis through any means. they better apologise for their anti-development move and talks against ethiopia and should wait for ethiopian response on nile.the position egyptians are pretending to play is actually the position that should be played by ethiopia, that is the fact. egyptian arrogance and misunderstanding of the other nile basin countries ends with shame to egypt, assume when every nile basin country come together to ask for their share, as egyptians call nile river as thier national interest, the other african nation call it a matter of soverginty. no matter how it will be, no way egypt continue using the amount of water that it had been using in the past.